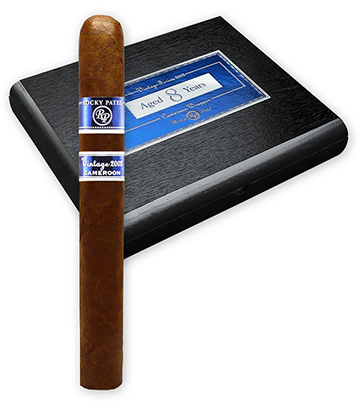 Rocky Patel's Vintage 2003 cigars join his very popular Vintage 1992 and 1999 lines. Aged 8 years, the beautiful and delicate Cameroon wrapper of the Vintage 2003 cigar surrounds a proprietary blend of Nicaraguan and Dominican long filler tobaccos and Nicaraguan binder. Handmade in Honduras, the Vintage 2003 Cameroon is a creamy and earthy medium-bodied cigar with a great flavor profile that includes light spices, coffee, leather, and nuts. A perfect cigar any time of the day.